Our family has known Br. Michael, Br. Joseph and many of their brothers for a long time. These are good men, loyal to Christ’s one, holy, Catholic and apostolic Church. The brothers worked and prayed with the Latin Mass community here in Detroit for many years. Their presence gave a stabilizing security through many turbulent times for us. 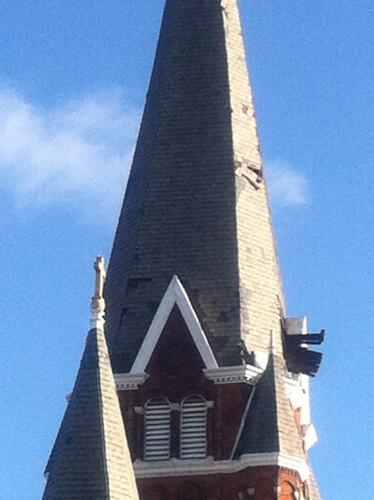 One of those times was when St. Josaphat Church nearly closed after November gales ripped a hole in the steeple. The chief feature of St. Josaphat Church was its immense central steeple built in the late 1800s still with its original slate roof. Like all inner-city Detroit parishes, decades of urban decline had caused timely maintenance projects to be put off indefinitely lest the parish accrue drowning debt without any hope of ever paying it down. Now the majestic steeple was bowing over the nearby expressway like a sail. Not knowing when or where the tower might collapse, the entire church campus was placed under condemnation order by the city and the access road in front of it had to be closed off. Our parish community was displaced from our beloved, historic church. Our family and many others looked to Br. Michael at this time for his knowledge and natural leadership. In the end, our Latin Mass community was able to survive this ordeal intact. In fact, it continued to thrive in spite of it. Less than two years later, after much prayer and effort, we were back into a newly repaired St. Josaphat Church, which because of this remains open to this day. During their years in Detroit, the brothers helped four of my children prepare for their First Confession and First Holy Communion. Listening to their catechism lessons was always a blessing. Not only did they engage my children in a way that helped them to understand the Faith, but they helped me to come to a deeper understanding of the Church’s teachings too. They started and led a neighborhood evangelization program for a time, chanted Vespers and other prayers publicly at the church and helped visiting priests and our regular pastor with preparations for Mass and other liturgical celebrations. They helped get started a Ladies’ Altar Guild and regular Sunday potluck for the large families, which I was a part of. They were instrumental in making a diffuse Latin Mass community really come together and to have a parish life that we never had before. 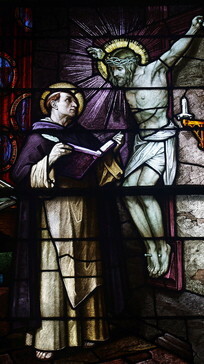 All of these men were true witnesses to the Faith whom we looked to for inspiration. They were models of virtue in all that they said and did. They were powerful examples to men —young and old— inspiring them to an authentic faith. My eldest son even asked Br. Michael to sponsor him for his Confirmation, showing the deep regard he held for him. My two younger sons loved to horse around with the postulants and we welcomed them all into our family. All of my children looked forward to their visits and them chanting Vespers at our house. We even had neighbors stop us to ask what the beautiful music emanating from our house was. They were lapsed Catholics and they told us seeing the men in cassocks and hearing the chanting brought back many good memories for them. I consider my family blessed beyond measure to know the men of St. Thomas Aquinas House. I was heartbroken to learn that they were moving out of state —many of us were actually in tears. Their loss is still keenly felt in our community, and it shows the impact they had on so many lives. Even while a good number of us were grumbling about them having to move, they displayed a heroic acceptance of God’s will that stopped us in our tracks. By their fruits you shall know them: and I know of only good fruits from these holy men.